"Mark is an effective leader and catalyst in many ways for the good sustainability and future development of Waterloo. As many others have already pointed out, Mark has worked diligently to bring fiscal order to our city, to ensure safe and livable neighborhoods and to garner global recognition for Waterloo. As citizens in Waterloo, we are very lucky to have him as one of our councilors." "Mark Whaley is a wonderful community fuser. His knowledge and encouragement have been immensely helpful during the early years building our female-founded tech business in Waterloo." "Marks continued dedication and commitment to our community has helped create an international awareness of Waterloo and all of the innovations taking place here. Mark is a truly creative and forward thinking individual. He is a strong supporter of community diversity, the environment and the unique startup community found in Waterloo. His keen business sense, entrepreneurial nature and willingness to mentor have benefited a number of local startups in Waterloo. Mark Whaley is a tremendous asset to the citizens of Waterloo." "Mark Whaley loves this community more than anyone I know. 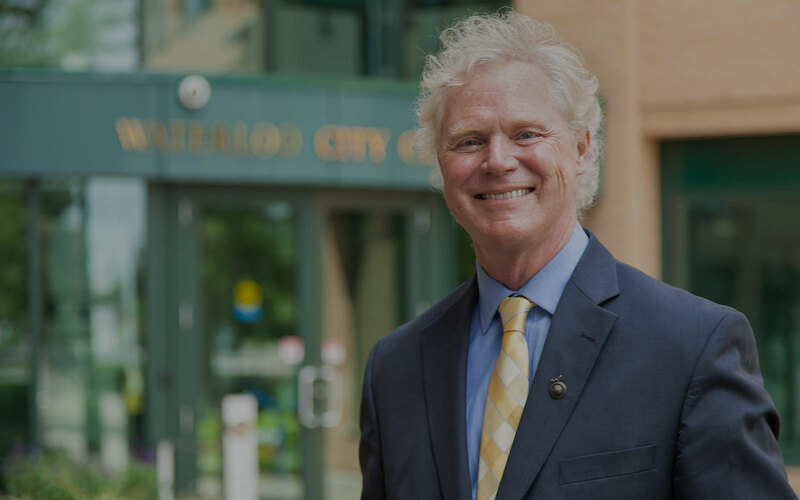 He is an authentic and experienced councillor as well as a pioneer and backbone within our Waterloo Region's innovation, social enterprise, and sustainability movements." "Councillor Mark Whaley has been a torch in the dark for new immigrants to our community who helps show us the way." "I've had the chance to work closely with Mark Whaley during the past few years. His passion, selflessness and dedication to the Waterloo community continue to amaze me." "Mark combines the rare traits of having unbridled faith in his community's future, an ability to solve daily problems and the vision to understand what is required to build a community that is able to adapt to the 21st century and its possibilities." "I have observed Mark Whaley from many perspectives and he certainly works diligently on behalf of the citizens of Waterloo." "Mark has the admirable ability to balance the larger agenda of a world-class city with the grassroots needs of the local citizens. This ability extends to prudently accommodating and promoting the many unique and diverse needs of various community stakeholders." "Mark can always be relied on for his keen insight, support and involvement. Mark is much more than a councillor, he's a friend to the community." "Councillors like you are hard to find. Hope your constituents have learned what the residents in Northdale learned when you represented us. They can't find a more involved and concerned representative." "Leadership requires vision, dedication, experience and commitment; Mark delivers." "Mark Whaley is the exemplar of what a councillor should be. He is one of the most community-focused people I know. He walks the extra mile in helping the citizens of Waterloo with their concerns. He is forward thinking. He is insightful. He does his homework. Mark is truly committed to the current and future wellbeing of Waterloo.""